Timothy Hyde, international mentalist and founder of the MagicCoach.com project has a big secret. Over half of his business, is actually as an MC at corporate events world wide. His clients have used him in - South Africa, New Zealand, USA, every corner of Australia and he is about to head off to an assignment in Cambodia. Many magicians have crossed over into this exciting and lucrative market, using the skills they already have to create fun and impact at a huge range of events. The market is vast and expanding. Assignments can include - Corporate, Association, Government, Social & Sporting events to name just a few. Sure, anyone can get some snappy photos done, get a webpage developed, business card printed and YES you may well be able to score a few Corporate jobs as a Master of Ceremonies. But, it's what you do "at the job" that's important! This is what builds your reputation, gets the bookings, builds word of mouth and importantly gets the repeat bookings. What really matters is your content, attention to detail, understanding of the job, dealing with issues, being proactive so problems don't crop up, how you connect with others like the - AV team, banquet team, the delegates, the committee, the speakers, the conference organiser. It's your ability to engage, to lead, fill time, link speakers, to introduce and thank. 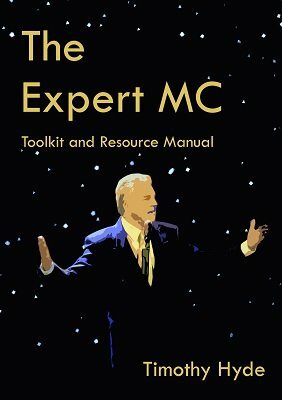 The Expert MC Toolkit & Resource Book comes in Three Parts - Content, Advice, Resources The Content Section is a huge collection of - Ideas, Activities, Scripts, Lines, Quotes, Stories & Jokes that can be used in many different MC situations. They range from funny lines and jokes, interactive exercises and ice breakers, more meaningful Intros and content that can be used as "bridging" material. Also included is a section of all important Filler Material. Things you can do to fill in a 10, 15 or 30 minute gap in proceedings if a speaker is running late or you just need to keep the room occupied until lunch is ready to be served. The How To / Advice Section is - Advice, Tips & Techniques on how to be an effective MC. It includes a series of Advice Articles from a range of different professional MC's, nuggets of information on the real business of being an MC and some general overview of what you need to do to successfully fulfil your role. The Resource section contains links to Recommended Books, Websites, Tools and Checklists. There is also an invitation to join our thriving LinkedIn Community. Lastly there is a link to a special section just for magicians. One of the Huge challenges that most professional MC's face is that they have to constantly compete for jobs with - TV stars, Famous Sports People, Newsreaders etc. Conference and Event committees are often under great pressure from delegates to get a well known "face" in to run the event. The delegates like to meet these people, have their photo taken with them etc. Speaker Bureaus will also push these people before they recommend professional MC's because they are in some ways an easier "sell" and they tend to have higher fees because of their profile. Our job is to provide such great content and such a professional service that they will not consider using anyone but a Professional MC. The Expert MC Toolkit & Resource Book will help you do just that. The Content section contains much of my A Material - lines, jokes, quotes and activities I use myself in my corporate assignments. But this material is not just for Corporate - if you work at Social Gatherings, Weddings, Community Events or even Magic Events, you will find plenty to use here. Professional tips on keeping Speakers "ON TIME!" Two of the routines included in the Content Section have been published previously in the bestselling Secret NoteBook of Mr Hyde Volume 1 which you may have read. These are The Pig Test & Seven Days routines. They are only a small part of the whole publication, but we wanted you to be aware before purchase that they are included. There is a downloadable Bonus Section for Magicians with the book. The 2nd edition was expanded with 22 additional pages: Ten tactics to grow your MC business, 30 briefing questions to ask your client, 25 questions you can ask any speaker or celebrity guest, my favourite energy booster for dinner events and three vital checklists for any event. 1st edition 2015; 2nd edition 2017 117 pages.